Hello! This is America and I'm back to share a shaped card for my DT post today! Here it is again in different lighting and background. This really shows off the dies detailing especially in this mirrored cardstock! 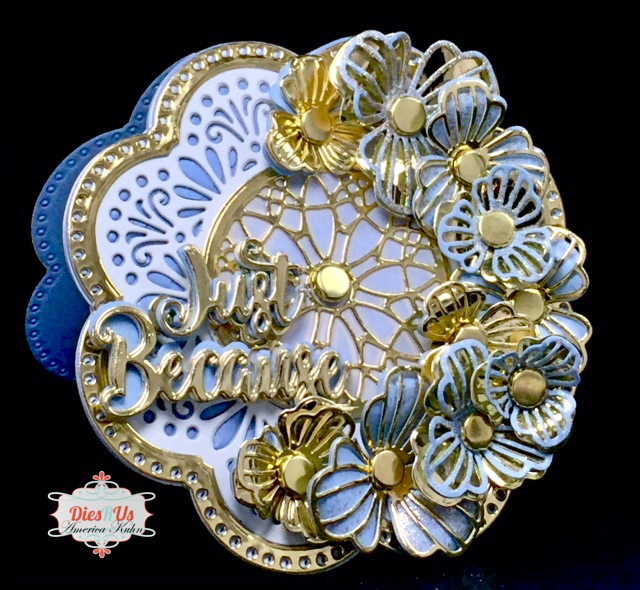 This beautiful "Claire" cutting die is great for the shape of a card base. Look at all the delicate detailing in this gorgeous cutting-die by Sue Wilson. There are many tutorials on creating a shaped card base out there. For mine, I cut the shape three times, scoring the center cut at top by folding it over 1/8 inch and adhering it to the back pal which is the second cut. The third cut is adhered on top. To create the flowers, I first cut these out of the CE Sky Blue Cardstock, then the CE Mirrored Cardstock. I bent each petal by rolling it and pressing it with my fingers over and around my stylus tool. These flowers were adhered with 3d glue dots for added dimension. They are layered one over another, (alternating the open and striped) in gold and in blue cardstock as seen on the flowers here. 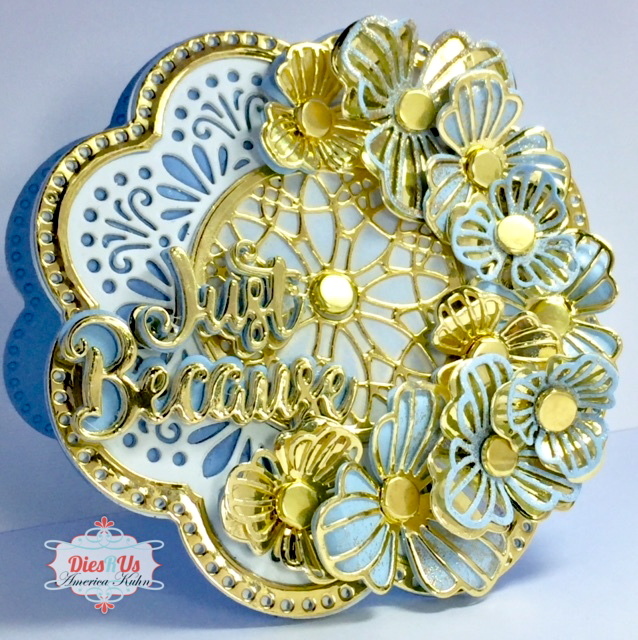 The sentiment is multi-layered with 2 gold cuts, 2 sky blue cuts and one white die-cut. Doing this gives the sentiment great dimension and helps your sentiment stand out better - esepcially against a busy backbround. These adorable Mini-Sentiments are just the perfect size for all your card needs! Just stunning America! Beautiful inspiration ... thanks! This is gorgeous! Love all the dimension on this card. Oh my gosh! This is amazing!